SNES Contra III: The Alien Wars (USA) "pacifist" in 14:25.25 by Ash Williams. Trying to strike a compromise with peace activists, the guy who destroys the world bare-chested has been ordered to stop an alien invasion while taking as few lives as possible. 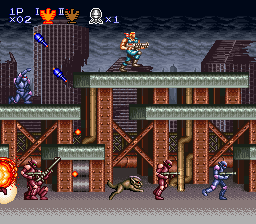 As such, this run completes Contra III: The Alien Wars by only killing the minimum number of enemies required to win the game. This requires much more careful dodging than the any% run does. Our hero takes the dodging one step further by adding the limitation that he cannot shoot enemy projectiles. However, frustrated by the lack of carnage and by the political pressure, our hero lets off steam sometimes by shooting the scenery and doing entertaining dances and poses.